This example shows how to add your logo above the ‘Sign In’ message in the login screen. As you’ll see below this is basic HTML code editing, so there is plenty of scope to show your logo wherever you want on the login screen. Next we need to copy the some of the files used by OBIEE to display the web pages to a new area so that we can edit them. If the msgdb directory does not exist, create it first. Now go into the pages\common directory and you’ll see one of the files – signin.html. This is the html page that displays the login screen. Take a backup copy of it first before starting. Edit login.html in a text editor. With the <img tag altered to suit your details – the logo file name, the width and height and the alternative text to display if the logo cannot be displayed. You now need to restart Presentation Services – either restart just Presentation Services in the Fusion Enterprise Manager, restart all services or just stop and restart OBIEE using your normal method. 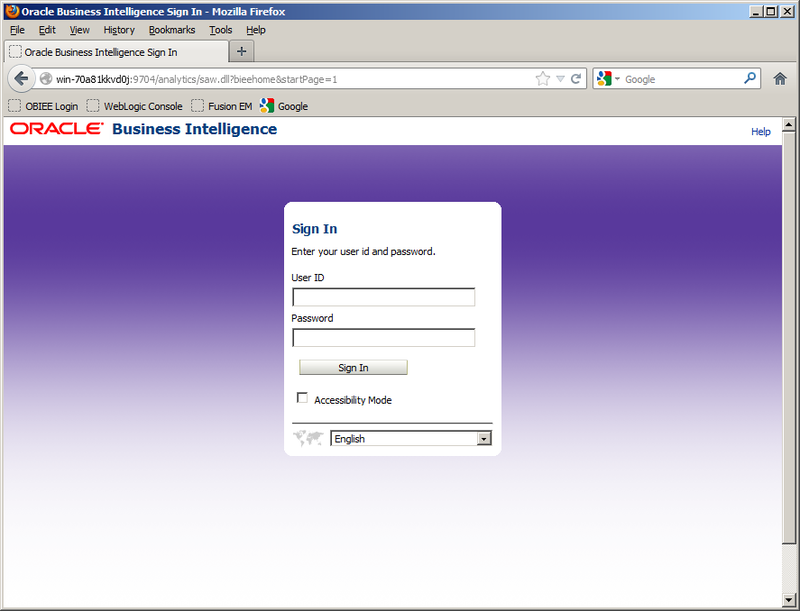 Changing the colour of the OBIEE login screen. 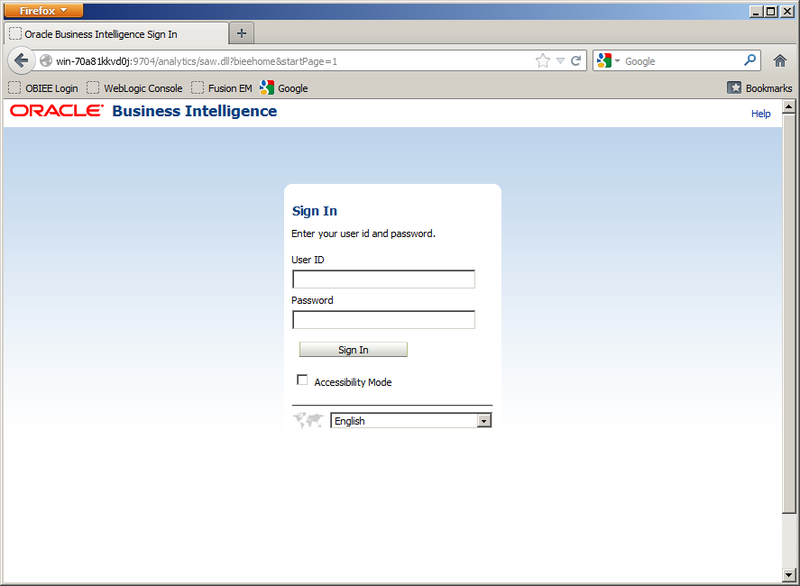 The second post on customizing the look and feel of OBIEE - changing the colour of the login screen. This can be changed by editing the image file and altering the colour as required. Take a backup copy of the file before beginning. Now edit the file in your favourite image editor – I’ve used paint shop pro. The image is just a narrow strip of blue to white fading down the screen. First set the current colour to the what you need – I usually use the dropper tool to obtain the colour from an existing image (such as a screen-shot from a web site). Now you need to select the paint brush style, with the default stroke type, but set the size to 500 or higher – this would produce a very large faded circle as the paint brush stroke. At the very top of the image do one mouse click. Because the image is very narrow you only get a very thin slice of the paint brush stroke, producing the faded colour effect we need. Save as the image as the original background_blue_whitegradient_.png file and copy to all three directories above overwriting the existing file. In the browser at the login screen you just need to force a refresh – use Control-F5. This is the first of a number of posts I'll be making about altering the look and feel of OBIEE 11g. The official method is to create new skins, however this is quite complex if you only want to make a few tweaks, so below is the first example of workarounds to make minor changes. This requires changing original OBIEE installed files, so be sure to make a backup of any files before altering them. This is just a minor change to a single file – common.css. The catch is there are four copies of this file so you need to repeat the change in all four. Note it’s actually the common.css file in the third of these directories which immediately affects the dashboard, so test different colours and shades with this file first before altering the others. Take a backup copy of these files before you begin. Edit the common.css file from the first directory in a text editor. Unfortunately these files have their entire contents on one line, so it’s a little difficult to read. The first parameter in the .HeaderContainer section is the background colour. You just need to change this to the colour you require. #0D4988 is the default blue colour. Finally once the files are saved refresh the browser cache by using control-F5 to reload the files and the colour should change. Want to add image/logo at left hand side of sign in box, I am using bi version11.1.1.7.1. Can you please tell how can we achieve this. For Indepth training on OBIEE and Other datawarehousing technologies get in touch with Primetech4all and below is the mail id for the same. OBIEE - How to set a server variable with the session type via a dashboard prompt (with a request variable) ? The issue was at the Aggregation Content Level.The Correct Settings are in between the facts and dimention tables. all copyright belongs arjun. Simple theme. Powered by Blogger.